My first collection of magazine gag cartoons is available now. It's called Penguin vs Polar Bear and Other Ridiculous Cartoons, is 104 pages long and, well, has lots of cartoons in it. Here's part of the back-cover blurb: "An encounter between a penguin and a polar bear may sound ridiculous, but it is just as plausible as a prehistoric man attending a job interview, or a cat completing a sudoku. Anything is possible in the world of the magazine gag cartoon. 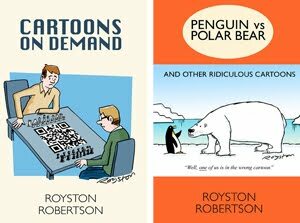 "This collection by Royston Robertson is made up of cartoons featured in Private Eye, Reader’s Digest, The Spectator, Prospect, The Oldie, New Statesman and others. Some are satirical, others just a bit silly, and they cover subjects from art to technology, the environment to religion, history to Health & Safety. All human (and inhuman) life is mocked." Sound good? The ideal present for the discerning cartoon lover in your life? Then head over to my newly set-up Online Shop. 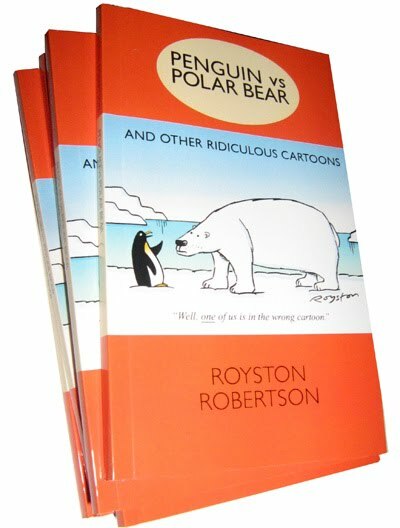 You can see some of the cartoons there and buy a signed copy of the book for a mere £5.99 plus £2 p+p.